If you haven’t decorated yet, this beautiful delightful Christmas wreath crocheted square is a great decor for the holidays. This stunning wreath square can be a perfect gift for friends and family to add to their holiday decorations. Make this crocheted square today in time for the holidays. With its wreath design, this lovely Christmas decor is a great crochet project for intermediate to experienced crocheters. Once completed, this lovely crocheted square for the holidays should measure 5.5 inches by 5.5 inches. 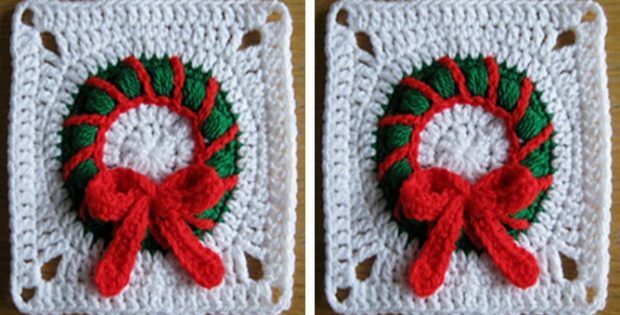 If you prefer to measure using the metric system, the finished crochet wreath square should be about 14 cm by 14 cm. Carola Wijma is the designer responsible for this charming wreath crochet pattern. In fact, you can download the pattern for this crocheted delightful wreath square for FREE. To access the FREE pattern for this lovely Christmas wreath crocheted square, please click here: Christmas Wreath Square Pattern. Featured image: Carola Wijma – thank you!